I hesitate to post this menu plan, my friends. I mean, you seem to like the Friday posts so much. I understand, I guess. A Friday menu plan gives you time to incorporate interesting recipes into your own menu plan for the following week. But here's the thing, Monday is better for me, and it is all about me, ya know. It has been super hot. Ugh. I am sooo not a fan of hot. But we're in the home stretch now. It'll be cooling down soon. In the meantime, I'm trying, and mostly succeeding, to not heat up the oven for meals. Desserts, on the other hand, are totally worth it. I read, on a blog, the other day, that procrastination is really just a way of delaying decisions. 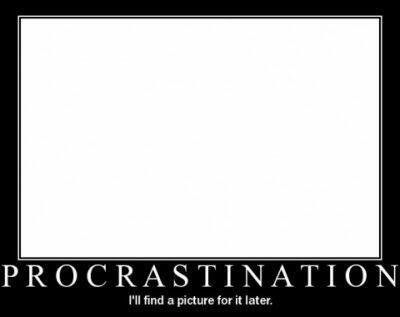 As a lifelong procrastinator*, that statement rings true for me. Case in point: right now, as I am typing, I have two wedding gifts sitting, unwrapped, in a corner of my bedroom. I have had these wedding gifts in my possession for at least a month. I will be giving one of these wedding gifts away on Friday. But I haven't wrapped them yet. 7. "accidentally" forget to bring the gift to the wedding and ship it later, with or without wrapping paper (delaying the decision even further). Can't do that, though, because we need it for the reception. All of these options have merits. All of them have disadvantages. My brain cannot sift through the possibilities and decide on a course of action. So I continue to procrastinate. The author of this blog asserted that delaying the decision is not going to make it any easier to make, and if we keep delaying decisions, we will end up with a pile of decisions to make all at once, so we should just do it right away and get it over with. While that's not true in every situation**, it's mostly true. I know that. But knowing doesn't help. You might be thinking that the fact that I have had these wedding gifts for over a month, for weddings in July and September, would tend to belie my statement that I'm a procrastinator. A true procrastinator would buy a gift on Friday for Friday's wedding. I guess I'm just a selective procrastinator. I knew exactly what I wanted to give these beautiful couples in celebration of their unions, so those decisions were easy. I procrastinate only when the decisions are difficult. Like the wrapping paper thing. *I am a lifelong procrastinator, except for the time period starting in the winter of my freshman year of college and continuing until...well, I'm not sure when I stopped not procrastinating...but that's another story. I think it's funny that I can pinpoint the day I stopped procrastinating. It was ... memorable. **Sometimes decisions are easier to make after a delay, like for instance, if one can't decide whether or not one wants to buy tickets to an event, if one procrastinates, there is a good possibility that the tickets will be sold out, which makes the decision-making super easy. P.S. I'm going to wrap that present now. Plain brown with pretty ribbon. If I can find the pretty ribbon. If not, I'm going with camouflage. Do you ever fell like it's more fun to exist in the computer world than in the real one? Is that the only place you fell like you can control your destiny? Well, God is the original great world builder, and he gave us the power and the skills we need to make changes in the real world. The NIrV Minecrafter's Bible contains the entire text of the New International Readers Version of the Bible. It includes 24 pages of full-color illustrations in the style of Minecraft, interspersed throughout the text. These pages each contain a brief explanation of the story they portray, a Bible passage to read for the story, and a challenge to complete in Minecraft. The book also includes a table of contents, an alphabetical listing of the books of the Bible, a dictionary of terms and a listing of where to find "Great Bible Stories." I like that this book contains the entire text of the Bible, from Genesis to Revelation, and the NIr Version is easy to read and understand. As the Mama of a Minecraft fan, I also appreciated the tie in to Minecraft. The tie-in will draw in Minecraft fans, and the challenges will keep them thinking about the stories they've read. The color illustrations are placed in chronological order, but not next to the story they portray. It would be nice to have the text adjacent to the explanation, picture, and challenge. I also wish this Bible had sidebars within the text itself, explaining concepts, and drawing parallels to the game and to real life, like other children and teen Bibles. Bottom line: This book will engage your Minecraft fan, and the Minecraft challenges will keep her thinking about the Bible. 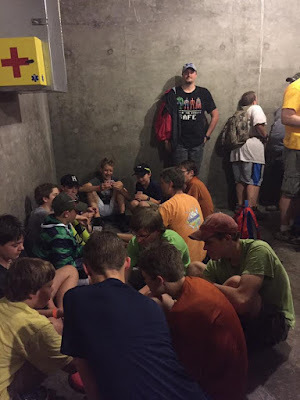 Sometimes I feel like a scout from my generation, sent out ahead to experience in my fifties what even the healthiest boomers are going to experience in their sixties, seventies, or eighties. There are far worse medical conditions that Parkinson's, and there are far worse cases of Parkinson's than mine. But what I have, at the level I have it, is an interesting foretaste of our shared future--a beginner's guide to old age. I wanted to read this book because not only do I have baby boomer parents and in-laws, who are aging, but also, someone close to me has been diagnosed with Parkinson's disease. I was expecting tips or encouragement for people who are aging in general, and living with Parkinson's Disease in particular, but I didn't find that in the pages of this book. What I found was a frank exploration of aging, from the perspective of the particular generation known as the baby boomers, with their shared experiences and values as an age cohort. Mr. Kinsley explored aging from the perspective of "winning" at aging. Does the person who lives the longest win? Or the person who keeps hold of their physical or mental capacities? Or the person who leaves the longest lasting legacy? The book was interesting, but because it wasn't what I was expecting, and because I am not a baby boomer, I couldn't really get in to it, and I didn't like it all that much. The book contains 140 short devotions, arranged in 11 categories, such as "On Being Yourself and Living With People," and "On Getting it Right." Each devotion consists of a short story or anecdote, which often quotes scripture, along with a short Bible passage at the end. I really wanted to like this book--unfortunately, I didn't. I did like the organization of the book into categories. Each category page listed the title of the category, along with a short, one or two sentence explanation. The categories would make it easy to find encouragement for specific situations. But the stories and anecdotes did not resonate with me, and I found myself reading about the same stories multiple times. The scripture references were mostly from the New King James version of the Bible, which I find somewhat difficult to read. What bothered me the most is that the short Bible passages rarely seemed to have anything to do with the devotional I had just read. Bottom line: Loved the concept, did not love the execution. * I reviewed the electronic edition. Is it really an update when I didn't tell you about it in the first place? I dunno. Whatever. I'm too tired to think about that right now. Anyway, it's a jungle out there. According to the square foot garden people, tomato plants can be spaced one per square foot, so last year, that's what I did. And those plants got huge! And crowded out everything else in that bed, including the poor zucchini plants. So this year, I decided to give the tomatoes a little more space. This year, I planted 8 tomatoes in 16 square feet. And just look what happened. It's so thick in there, you can't see through. I'm loving it, because I'm thinking this much tomato vegetation means lots and lots of tomatoes for me. But once again, I have to say I am thankful that tomatoes turn a color other than green when they are ripe. Here's the first tomato to set (that I'm aware of). I'm watching it to give me an indication of when the first harvest will be ready. Tomatoes are not the only thing I planted this year. I also planted zucchini. They're doing amazingly, out from under the tyranny of the tomato plants. I think they're taller than Bubby. And this is what happens when you go away for 3 days, in July, leaving your zucchini plants unattended. I guess I should have included something in there for size comparison, but suffice it to say--those things are huge. If you've never grown zucchini, you might not know this, but those suckers can go from non-existent to baseball bat in a matter of days. I was talking to AKD this morning about the salsa (yes, I broke down and bought tomatoes, and I was making sure that he was still willing to help), and I said we could put zucchini in it. AKD insisted that we needed to save all of the zucchini for zucchini muffins. Um. I'm harvesting a zucchini a day. Each zucchini makes two dozen muffins. That's a lot of muffins. I don't think even AKD can keep up with that kind of production. For the first time ever, I will have zucchini to celebrate national sneak zucchini onto your neighbor's porch day. Yes. It's an actual thing. Don't say I didn't warn you, neighbors. I also planted strawberries this year. And I've gotten to eat one. Some creature keeps sneaking in and eating them as soon as they're ripe. And that's it. Tomatoes, zucchini, and strawberries. But really, what else does a person need? Oh. radishes. Apparently, Hubby needs radishes. Unfortunately, he didn't tell me he needed radishes until a couple of weeks ago, and now it's too hot for the poor little things. They're going into the zucchini/strawberry bed at the beginning of September. I'm already planning for next year. They boys said they would build another 4 x 4 foot garden bed for me, so next year it'll be strawberries (with better protection) in one, tomatoes in another, and zucchini, corn, and pumpkins, as well as any other random veggies or fruits the fam wants in the third. I'm also thinking of planting asparagus in another, already existing bed, but we'll see. And that's what's happening in the jungle garden. I'll leave you with this picture of the jungle canopy. Whoa. Another Friday Menu Post. Yeah. Well. Here you go. 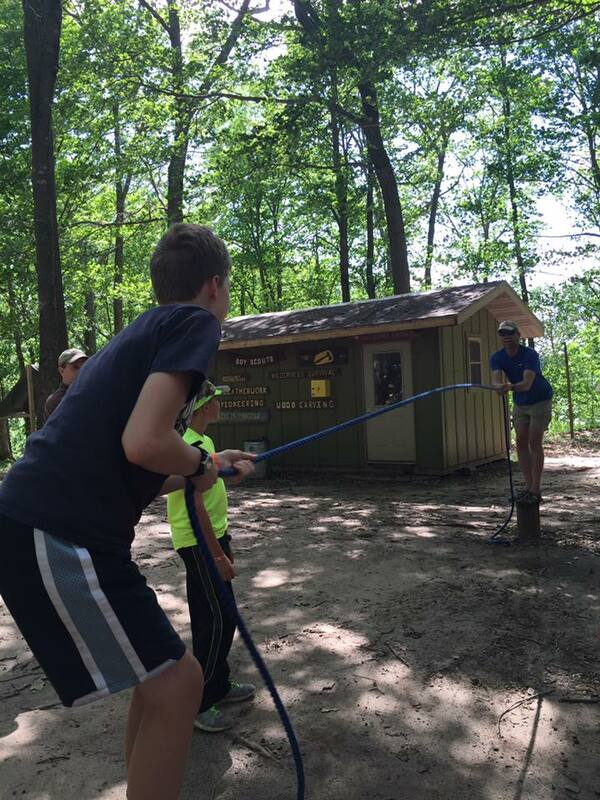 AKD and MC were away at Boy Scout camp last week. Special thanks to A Friendly Boy Scout for taking most of these pictures. It's become a tradition for Troop 168 to spend part of their time at camp in the storm shelter. What a first night welcome for these boys! Here they are playing janitor while waiting for the all clear. These boys set a goal to climb a mile during their week in camp. 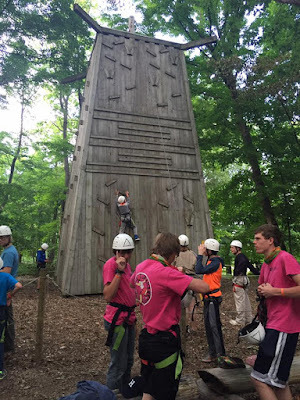 That means 165 ascents of the climbing tower. They did 175. AKD and his best buddies in the foreground--waiting to climb. Isn't it cute how they're matching? 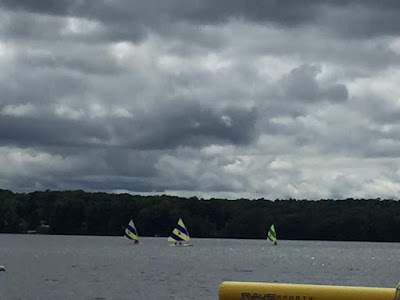 My middlest boy earned the small boat sailing merit badge. 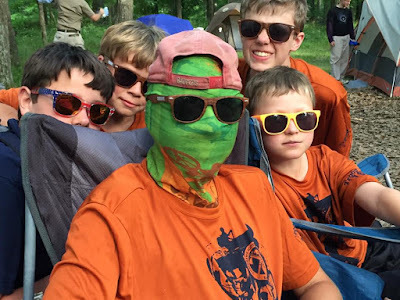 Best merit badge at camp, so I'm told. 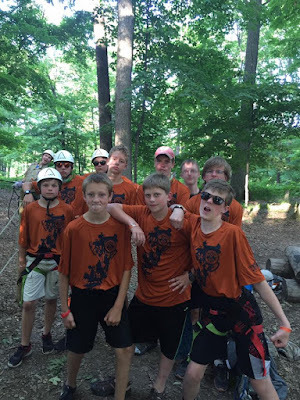 There aren't many pictures of AKD because he was off doing high adventures instead of just, you know, regular adventures, and A Friendly Boy Scout did not go along--regular adventures were plenty adventurous for her. AKD had a great time, though. His favorite day consisted of mountain boarding and ... well, two other things that I didn't hear because I was too busy freaking out over the fact that my son went mountain boarding. 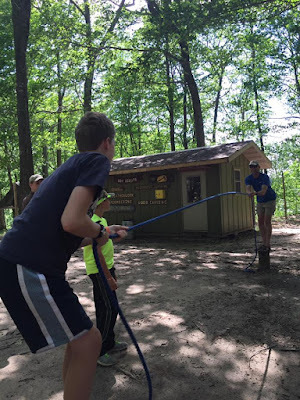 AKD has earned just about all, if not all, of the merit badges offered at camp, so he just gets to have fun. You can really tell he's having a lot of fun from this pic, can't you? MC earned five merit badges: small boat sailing, emergency preparedness, first aid, geology, and cycling. The rest of us muddled through the week at home. We were lonely without our biggest kiddos, but we made it. I must say, it's...challenging...cooking for three, now that I'm used to cooking for five, and I can definitely understand why persons who are used to cooking for more might have trouble suddenly cooking for less. Especially if these persons don't really like leftovers. I can relate to a lack of ambition to prepare meals--it hardly seems worth the effort to cook an entire meal to serve just three people, and, since Hubby was at camp for both of the bracketing weekends, I discovered it feels even less worthwhile to cook for just two. Or not-so-suddenly cooking for fewer, I guess. These are planned transitions, after all. From the very beginning, We've planned for these children to live with us for only a short while. We've planned for them to grow and learn and be independent. As our kiddos grow and leave home, we'll be down to four, then three, then two again. As it should be, of course. These periodic glimpses of the future are a great reminder to enjoy the time I have with my family. If all goes as planned, they will leave in time, but we are not guaranteed that all will go as planned. Well! I guess that answers that question. Y'all can handle a Friday menu post. I'm not sure if I can, though... But I'll see what I can do. These chocolate chip graham muffins from last week's menu are Bubby's new favorite--the cinnamon streusel topping adds a satisfying sweet crunch, and the addition of graham flour, in the form of crushed graham crackers, takes these chocolate chip muffins to a new level of deliciousness. These muffins are reminiscent of chocolate covered graham crackers. Here's the recipe, very slightly adapted from Chocolate, Chocolate, and More. Make the topping: combine 1/3 c. flour, brown sugar, 1/3 c. crushed graham crackers, and cinnamon in a small bowl. Add melted butter, and stir until all ingredients are moist. Set aside. Combine 2 c. flour, sugar, baking soda, salt, and 1 c. crushed graham crackers in a large bowl. In a separate bowl (I use a 4-cup glass measuring cup), whisk together milk, oil, egg, and vanilla extract. Add wet ingredients to the dry ingredients and stir just until combined. Stir in mini chocolate chips. Distribute batter evenly between 42-48 mini muffins cups. Top each muffin with about 1 t. of the topping, and press the topping gently into the batter. Bake at 400°F until a toothpick inserted in the center comes out clean, about 10-14 minutes. Can you handle a Friday menu post? I know, I know, I know. In my defense, I told you menu posts would be sporadic during the summer. It's OK. Having the menu plan available on a Friday might be a good thing. I mean, it might help you to plan better. So take a deep breath--we can get through this together. And you can always wait to read this until Monday, if you just can't deal with it. I will talk more about Wildtree in a future post, but I needed to tell you I went to the workshop, one, because you'll be seeing Wildtree meals in this menu plan (and possibly future menu plans, if I have any meals left the next time I do a menu plan post), and two, because one of the two people who actually reads my menu plan posts was at the workshop, and she told me she's missing the menu posts. And she needs links. And inspiration. Unfortunately Wildtree does not post their workshop recipes online (can't say I blame them), so I'm a little light on the links, but I've got inspiration a-plenty. Or a-bit? A-little? Let's just say you could be inspired. Cookies. I need to have the boys vote to figure out which kind. You can vote, too. Pie. Again, I need to ask the pie-eating boys what kind.